H1N1 Conclusion: Whether or not there is a real Swine Flu pandemic raging, whether or not it may be real biowarfare, or mainly psyops being waged upon the unsuspecting world's public in combination with other fabricated global threats, I am saying 'NO' to Swine Flu Vaccination. All this heavy-handed hullaballoo appears to me to be yet another “war on terrorism” to fabricate a global pretext for quite a different agenda from the publicized one. The real agenda this time around being to inoculate the world public with something inimical in the guise of fighting the pandemic. This is more than simply an attempt to sell vaccines of dubious efficacy for hefty corporate profiteering. It suspiciously appears to be the new “imperial mobilization” of the long wished for population reduction agenda, 'to “prime” populations worldwide'. The threat of the A/H1N1 virus killing some (or many) people may well be real even if manufactured, just like 911 – the “new pearl harbor” – was a real demonstration of fabricated threat by controlled demolition which killed many thousand people. But under these dubious 'sky is falling' conditions made to “look like a great ‘booming, buzzing confusion’ to use William James’ famous description of reality,” the most rational and commonsensical course of action under conflicting claims of vaccine safety and efficacy backed by draconian 'police-state' policies to forcibly administer it: 1) take one's statistical chances with the “pandemic” rather than with its forced “cure”; 2) permit the human body's own natural defenses to fight the disease if infected, rather than be aided into oblivion by its purported helper, the vaccine! See note on vaccination here. See note on microchip implants here. See final note: on fait accompli. See The Ultimate Revolution in the Making here. H1N1 Postscript Saturday, March 13, 2010: 'Reconstruction of a Mass Hysteria – The Swine Flu Panic of 2009' The perfect example of another 'modified limited Hangout': “No one at the WHO, RKI or PEI should feel proud of themselves. These organizations have gambled away precious confidence. When the next pandemic arrives, who will believe their assessments?”, DER SPIEGEL staff concluded after their exhaustive study which appeared in their March 12, 2010 issue. 'Indeed', voiced Zahir Ebrahim of Project Humanbeingsfirst.org, The plebeian antidote to hectoring hegmons, and he was overhead by the “[anti-vaccine movement] Crazy people who think the vaccine will kill you” while administering that one word coup de grâce to the Council on Foreign Relations and its financiers for their incestuous disinfo session on Pandemic Influenza held on October 16, 2009 in New York. The merit of the CASE IS IRRELEVANT because the mercenaries and vulgar propagandists' half truths always triumph over full lies! The 'empire' plays to win strategically and can't be derailed by a handful of reactionary truth tellers after the manufactured crises have been affected – for had truth-telling any efficacy, Socrates might have been handed a trophy instead of the Hemlock, and Jesus the kingdom instead of the cross. The key to the success of Hegelian Dialectic(s) over time, is the diabolical Fait Accompli sewn in baby-steps. The impact of the invasion of Iraq upon its peoples cannot be reversed by withdrawing the American troops anymore than the impact of the Pandemic can be reversed by arguing whether the vaccine is good or bad. The Pandemic has already created its intended fait accompli – for, 90% of the masses are not only ready today to take the vaccine but also demanding it. The secretive agenda probably is to inoculate at least 50% of the targeted populations in this generation, priming them for at least two things: microchipping, and staging for long term population reduction/culling through some complex biowarfare protocol. They will surely achieve 70 to 80 percent success towards that goal in this round of the pandemic pandemonium. And this is a conservative estimate. That's pretty damn remarkable social engineering for one baby-step fait accompli. More baby-steps to come. The overarching agenda for world-government and its multi-dimensional goals is long-term, across multiple generations, and hinges on irreversibility of small baby-steps to eventually raise the complete Phoenix of the New Atlantis from the systematically burnt ashes in stages of the old order. Under the guise of this Pandemic look how much has already been achieved: the immense loss of national sovereignty to WHO. Under its level-6 Pandemic alert, WHO now controls the emergency response stratagems in all nations that are signatory to its convention. That's most of the world! “... Having said that, does it work to mandate [vaccination]? I think what would work better would be to say that there was a shortage and people tend to buy more of something that's in demand. (Laughter.) We saw that -- there was one season where, really, people lined up all night to get a flu shot. No one asked them that where did they get the new scientifically valid data (as opposed to anecdotal one) to change their expert recommendations so rapidly within the span of just a couple of months, when the vaccines for this new pathogen are themselves very new and haven't been around long enough to carry out controlled double-blind studies of their efficacy over the long term to know how many dozes are needed – since the damn virus itself is new and never seen before on planet earth? And the most crucial aspect to this question, no one asked the distinguished panelists who spoke in all sorts of foreign accents, that if, by their own admission, this 2009 virus is “novel” and “lacks certain signatures which other pandemic influenza viruses have ... which suggest that this virus is not a 1918 like virus ... or 1957 or 1968 virus”, then they could not have possibly known of the older vaccines' efficacy on this new virus a priori any more than the newly patented vaccines, and therefore, when did they actually test the vaccines on the new virus and upon whom? Because, practically speaking, how could they have tested the vaccines on the new virus (for any length of time) when they didn't even know, and surely now don't know, who actually has the virus and who doesn't since “the CDC abruptly advised states to stop testing for H1N1 flu, and stopped counting individual cases” way back in late July 2009? CDC GUESSTIMATED H1N1 CASES and REFUSED CBS FREEDOM OF INFORMATION ACT REQUEST ! So, where did the clinical testing data magically come from between the summer and fall, for the expert's statement: “we thought we were going to need two doses for every adult and since we are – only one dose,” – except out of thin air no differently than the missing WMDs in Iraq after the domain experts from that officialdom had similarly asserted that their “data” incontrovertibly indicated that these were there and about to be launched upon the United States unless the superpower invaded Iraq with the most absolute “shock and awe” immediately? Obviously not one science person in the audience, and those supposedly calling in their questions on Twitter, knew how to add 2 + 2 to become skeptical of the panelists' techno-babble gibberish anymore than any mainstream scientists have been of the official NIST report on the how the WTC towers catastrophically collapsed into their own footprints due to a short fire. No one among the questioners straightforwardly suggested to the expert CFR panelists that as per their own admission (quoted above), the simplest convincing explanation appeared to be their own one made in jest, that they were indeed artificially manufacturing demand for the swine flu vaccines for their own agendas! One could have further challenged the distinguished CFR panelists at this point by asking whether they were aware that the pandemic served CFR's own diabolical agenda of creating “an end run around national sovereignty, eroding it piece by piece [to] accomplish much more than the old-fashioned frontal assault” as was blatantly stated by CFR's Richard Gardner in the April 1974 Foreign Affairs article Hard Road to World Order, and that they, as stellar scientists, but perhaps un-learned in the ways of Machiavellian social engineering, were being played as mere pawns for creating justifications towards that globalists' agenda? But Judge for Yourself if unconvinced that there is more to this pandemic story, and consequently, more to the bizarre impetus behind the hook or by crook vaccinating the world's populations under its ‘booming, buzzing confusion’ than meets the eye. Or, if you'd rather skip to The Conclusion, or jump to the Preamble to better grasp the overarching dynamics behind the swine flu first, do it now. He said “It's a recipe for disaster” --- vs. --- She said “legal immunity”, no sweat! He files lawsuit in New York to halt the vaccination campaign “None of the vaccines against H1N1 have been properly tested” --- vs. --- She insists on vaccine safety with great authority as “the most important tool against the pandemic”! --- vs. --- And she strongly recommends “trust your government, trust the scientists, and take 3 shots”! Are you pulling your remaining hair out by now? If so, skip to the Preamble to better understand why such cacophony, the “booming buzzing confusion”, is part of the game to continually keep you off balance. If you want some basic horsesense of a plebeian, go back and re-read the Conclusion. And if you enjoy the experts' chatter, continue on. * See note on CDC Numbers. ** See FluTracker data by country and note on abetting the Pandemic. Earlier WHO Updates here. 'Although no final decision has been made to produce a vaccine against the new strain of swine flu, officials at the World Health Organization say they are aware of "pre-production contracts" by wealthy countries that may lay claim to substantial quantities of any that is made. Zahir's Comment May 07, 2009: While monopoly at legal-gun-point of patents-regime by rich nations on the basic seeds and germs of life is a legal travesty, and in my view a monumental global crime against humanity (watch Monsanto Sues, 1300 Indian farmer suicide, and read about Vandana Shiva's odyssey), in this instance, the matters have an additional dimension. One of calculatingly getting the unsuspecting 'untermensch' people to use inimical vaccination under pretext of pandemics to wreck a greater havoc. See note on vaccination. Therefore, this news bulletin appears to me to be of the pure psy-ops genre for demand creation. Attempt is being made to scare the developing nations – un-surprisingly also on the target list of NSSM-200 for population reduction – into panicking and frantically demanding their share of the vaccines from the rich nations. Victims willingly demanding and paying for the poison – almost like J.P. Morgan deliberately cultivating a run on the banks to seed the First Great Depression. Here, it is the work of the 'Mighty Wurlitzer' to seed the Great Population Reduction. There are many incremental stages to reach that ultimate culmination before these seeds of destruction might be fully harvested, just like there have been many incremental buildup-and-teardown-cycles to making America bankrupt by stages. It was seeded in the 1913 Federal Reserve Act by one generation of international banksters, before it could be harvested by another generation of international banksters, their own familial grandchildren, in the Great Bailouts of 2008-2009. And that too is only the prelude to the international banksters cementing their complete anaconda debt-grip upon the world which will culminate in their cherished dream of 'one-world' government, and a world population cut in half or less. The only rational way out of this impasse is for self-respecting nations, ones run by ruling-elite who do care about their peoples, their culture, their heritage, their traditions, who represent the hopes and aspirations of the masses for a better future rather than a non-existential one, to urgently break out of this false-paradigm of destructive globalism legally forced upon them. Boldly abrogate the patent-regime of profit-strangulation-destruction by exercising legal fiat domestically in every developing nation. Make your own vaccines, develop your own seeds, and trade and partner among your own nations of the Global South to create a massive trading bloc. Use that Global-South Alliance (GSA) to negotiate more equitable, and fair terms of trade with the rich nations of the Global North who now hold all the power and thus dictate all the terms. Protect that decision with your militaries if necessary – in a Full Spectrum Alliance – for, modern warfare runs silent runs deep, just as it runs loud leaving deep craters in the tabula rasa of the 'lesser' humanity! The Education Department said that more than 430 schools had closed [of the almost 100,000 schools in the country] affecting about 245,000 children in 18 states. ... The government issued new guidance for schools with confirmed cases, saying they should close for at least 14 days because children can be contagious for seven to 10 days from when they get sick. ... The U.S. death toll remained at one — the Mexican toddler who visited Texas with his family and died there. ... CDC also said the new swine flu virus lacks genes that made the 1918 pandemic strain so deadly. ... Though most U.S. cases have been relatively mild and have not required a doctor's visit, U.S. precautions include shipping millions of doses of anti-flu drugs to states in case they're needed, replenishing the U.S. strategic stockpile with millions more treatment courses, and shipping 400,000 treatment courses to Mexico. 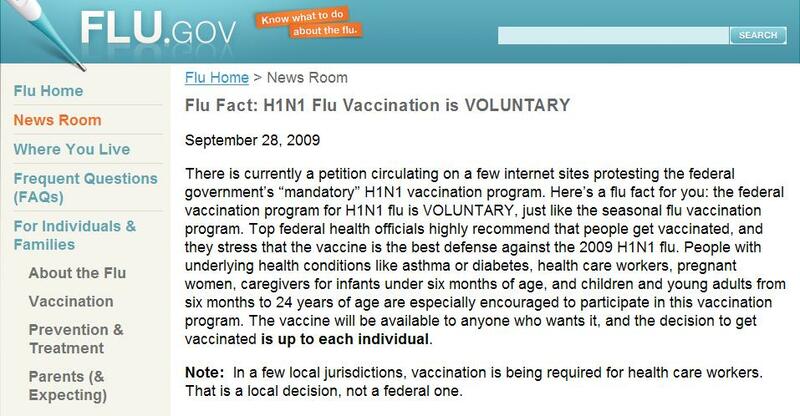 '1 May 2009 -- WHO is not recommending travel restrictions related to the outbreak of the influenza A(H1N1) virus. Today, international travel moves rapidly, with large numbers of individuals visiting various parts of the world. Limiting travel and imposing travel restrictions would have very little effect on stopping the virus from spreading, but would be highly disruptive to the global community. Also see Zahir's comments below under WHO urges flu precautions. Item 4 all but suggests of a deliberately targeted infectious pathogen at play. It also rationally contradicts the idiotic speculations of item 3 and item 2 which appear to be thrown in as red herrings. If malnutrition was the cause, it would have affected people in the more vulnerable age groups, not the strongest (assuming the young adults are not more malnourished than any other age group in Mexico, and anyone who has encountered Mexican migrant workers in the United States will observe that despite their poverty-stricken indigent lives, the young adults are strong, hearty, and more hard working than any other ethnic group at menial labor). Item 2 has no evidence to back it up either. 'GENETICALLY engineered biological weapons capable of targeting particular ethnic groups could become reality within 10 years, an expert panel warned yesterday. Viruses and other micro- organisms tailored to detect the differences in the DNA of races could offer warmakers and terrorists of the future a new means to carry out "ethnic cleansing", said the panel convened by the British Medical Association (BMA). An outbreak of a pathogen which in its initial stages appears to be more deadly towards a specific peoples (DNA) than others, reeks empirically of biowarfare test-case applied to a civilian population (just as the recent Monsanto's GMO crop failure in South Africa is evidence of the same). As the good doctor, WHO Director-General, Dr. Margaret Chan, candidly noted in her official statement on April 29, 2009: “From past experience, we also know that influenza may cause mild disease in affluent countries, but more severe disease, with higher mortality, in developing countries.” So observe its dramatic impact in side-effects: It has shut down a whole developing country economically. Shutting down the whole world temporarily as pretext for agendas already on the globalists' table can't be that far off: New global health controls for population reduction, a long held goal of the oligarchs (see Robert McNamara and David Rockefeller), disguised as global solution for infectious disease control supplanting the present advisory-only capacity of WHO, into a new binding 'global health policing authority' mandated by the United Nations or another surrogate of the International Banksters. This isn't so far fetched at all but directly connects motivation, cause, and effect. It is in fact entirely analogous to what is already being proposed for global central banking to respond to the manufactured global financial crisis, global 'carbon credits' under the aegis of the new global financial authorities to respond to the manufactured 'global warming' crisis, and global war on terror to respond to the manufactured 'global terrorism' crisis. Indeed, a pandemic which, by her own admission in the same statement, “may cause mild disease in affluent countries, but more severe disease, with higher mortality, in developing countries.” Under this wonderful raison d'être for “global solidarity”, Mr. Gideon Rachman of the Financial Times now has yet another 'horseman of the apocalypse' to add to his list of justifications for draconian world governance structures (see 'And now for a world government'). Also see Zahir's comments below under Swine Flu symptoms. 'To avoid confusion with other respiratory illnesses, Santa Clara County's public health department released these specific conditions to be considered for swine-flu testing. # Symptoms must include a fever above 100°F or 37.8°C and one or more signs or symptoms including: head and body aches, cough, sore throat, chills, trouble breathing, and vomiting and/or diarrhea. # People who experience a fever of 100°F and one or more symptoms should call their doctor or clinic. Plan to provide the following information: types of symptoms you are experiencing; recent travel to Mexico; contact with someone who may have influenza. # The Santa Clara County Public Health Information Line (PHIL) will be staffed to answer public questions about the swine flu. Call 408-885-3980. Zahir's comment: These symptoms are so generic that if one experiences them and goes to the doctor, one is immediately sent home or to quarantine pending test results – as confirmed by a friend's wife who is an internal medicine doctor at Kaiser. I am not sure at which point one is marched to the FEMA camps; Homeland Security is now already involved in this "pandemic's" management. When things deteriorate so far, one is left with no choice but to rationally follow governmental directives – for staying alive before staying free seems to be a sensible tradeoff – and this is why, in my opinion, to make the threat appear real so that civilians will be forced to make that rational choice of following state and federal directives, so many are dead! Commonsense is held in abeyance just like during the 911 event, as a 1918 viral strain, 'the Spanish Flu', classified as 'H1N1', which had reportedly killed up to 10 percent of the people who were infected in that outbreak 90 years ago, magically rears its head first in 1976, and now in 2009. Where did it live in hibernation all this time (see here and here)? This is why the unasked question remains, how does a virus walk out of the American biowarfare and other research laboratories and kill Mexico's youth while creating a global pandemic?
' ... Flu infects many animals, including waterfowl, pigs and humans. Birds and people rarely catch flu viruses adapted to another host, but they can pass flu to pigs, which also have their own strains. If a pig catches two kinds of flu at once it can act as a mixing vessel, and hybrids can emerge with genes from both viruses. This is what happened in the US in 1998. Until then, American pigs had regular winter flu, much like people, caused by a mutated virus from the great human pandemic of 1918, which killed pigs as well as at least 50 million people worldwide. This virus was a member of the H1N1 family ... Over decades, H1N1 evolved in pigs into a mild, purely swine flu, and became genetically fairly stable. In 1976, there was an outbreak of swine H1N1 in people at a military camp in New Jersey, with one death. The virus did not spread efficiently, though, and soon fizzled out. ... By 1999, these viruses comprised the dominant flu strain in North American pigs and, unlike the swine virus they replaced, they were actively evolving. There are many versions with different pig or human surface proteins, including one, like the Mexican flu spreading now, with H1 and N1 from the original swine virus. ... But the viruses have been actively switching surface proteins to evade the pigs' immunity. There are now so many kinds of pig flu that it is no longer seasonal. One in five US pig producers actually makes their own vaccines, says Vincent, as the vaccine industry cannot keep up with the changes. Those who have manufactured this "Black Death" ( http://cnn.com/2009/US/04/22/missing.virus.sample/index.html ) – according to the wishful skepticism of Bertrand Russell, as a more drastic substitute for birth-control for population reduction (see 'Impact of Science on Society', Chapter 7, especially pages 113-116, here is a link) – as a Machiavellian pretext to inoculate mankind with deadly biological-control and electronic-monitoring mechanisms, are monumental criminals nicely protected by legalisms, national security imperatives, and worthy science for primacy in biological and chemical weapons in the name of defending against any rivals developing it! If this pandemic is an accidental global happenstance, then so is the global financial collapse, global warming, global war on terror, and global implications of 911, all accidental happenstances! While good natured and conscionable research scientist obsess with fait accompli of 911 to expose the chicaneries which took America to World War IV, and conscionable jurist activists obsess with torture and murder by the previous Administration – all busily pursuing red herrings – new faits accomplis are being sewn as we speak! Are they so naïve to not appreciate that political science, and fait accompli, trump reactionary science and delayed conscience which only thought of awakening ex post facto? Or are they in on the game as manufactured dissent to distract people from pursuing the real efficacy? Having said that, if someone were to ask me for my humble opinion on this urgent Pandemic Alert which now plagues mankind, it would be based on the palpable truism: "it is too late to dig a well after one is already thirsty". Therefore, I would answer, follow rational commonsense and protect your family from the immediate curse of the "Black Death" as top most priority. There is however no best recipe to do so, and it ultimately would end up being a very personal Manichean choice, under the worst case scenario, between refusing inoculation and risking infection or FEMA hospitality, or accepting inoculation and risking the concomitant problems that are sure to come with it. One has to acutely understand that scientists and doctors are no more immune from being petty-shills for the New World Order than the newsmedia circus clowns, lauded scholars, holy priests, patriotic politicians, and other respectable “errand boys”. Thus, letting go of one's own modicum of commonsense can be as detrimental to one's personal health as letting go of it on the events of 911 has been detrimental to the world's health. Below is one rational way to reason it out logically, rather than emotionally, for all infectious disease alerts which are NOT airborne. The latter would surely necessitate a different rational analysis to be brought to bear on it. If the infection spread is limited or absent in your immediate area or region, and the number of deaths is less than the total deaths due to other common diseases per year in your region, and no one has knocked on your door with a gun and a syringe pointed at your child, then, braving the statistical odds and ignoring the media propaganda favoring inoculation against this man-made “Black Death” might be a reasonable bet. See note on vaccination. Do keep in mind however that the local and state authorities also have a mandate. Due to compartmentalization of such matters, many among them would most assuredly be genuinely believing that they are responding to a natural emergency and following the draconian federal directives only in the best interest of the public. In such chaotic conditions, as during Katerina, anyone refusing inoculation, or evacuation, will be deemed a threat to the community (and of course to 'national security'). The FEMA hospitality suites therefore have been judiciously prepared for the handful of 'malcontents' who might insist on making their own personal decisions contrary to federal expediency. See H.R. 645 and this. In order to mitigate public empathy, the 'enforcers' backing the local 'syringe-bearing' authorities may well be non-local military troops who would have no special empathy with the local peoples. See this and this and must watch this: http://www.youtube.com/watch?v=sN3a1oTdDwM . In any event, remember, that as Muslims, and other consummate theist-fatalists of any religion, we have much less to fear from the dreaded unknown. So keeping faith, take it one day at a time, one crisis at a time, one decision at a time based on the severity of the unfolding crisis and its immediate impact on you, and ultimately, one tomorrow at a time. Keep the chin up and remember to hum along (if you are not into praying): “Ooh, the sun will still come out tomorrow ...” as it did for our forefathers through many a tyrannical Pharaohnic time http://www.youtube.com/watch?v=Yop62wQH498 . "A boy is checked by a doctor at the emergency area where people with swine flu-like symptoms are checked at the Naval hospital in Mexico City Wednesday April 29, 2009. (AP Photo/Eduardo Verdugo)AP - Virulent swine flu spread to 10 U.S. states from coast to coast Wednesday and swept deeper into Europe, extending its global reach as President Barack Obama mourned the first U.S. death, a Mexican toddler who had traveled with his family to Texas. Total American cases surged to nearly 100, and Obama said wider school closings might be necessary." Swine flu a real swine! APRIL 29TH - MAY 5TH.
' WASHINGTON (CNN) -- Missing vials of a potentially dangerous virus have prompted an Army investigation into the disappearance from a lab in Maryland. The Army's Criminal Investigation Command agents have been visiting Fort Detrick in Frederick, Maryland, to investigate the disappearance of the vials. Christopher Grey, spokesman for the command, said this latest investigation has found "no evidence of criminal activity." The vials contained samples of Venezuelan Equine Encephalitis, a virus that sickens horses and can be spread to humans by mosquitoes. In 97 percent of cases, humans with the virus suffer flu-like symptoms, but it can be deadly in about 1 out of 100 cases, according to Caree Vander Linden, a spokeswoman for the Army's Medical Research Institute of Infectious Diseases. There is an effective vaccine for the disease and there hasn't been an outbreak in the United States since 1971. The vials had been at the research institute's facility at Fort Detrick, home of the Army's top biological research facility, for more than a decade. The three missing vials were among thousands of vials that were under the control of a senior scientist who retired in 2004. When another Fort Detrick scientist recently inventoried the retired scientist's biological samples, he discovered that the three vials of the virus were missing. The original scientist's records about his vials dated back to the days of paper-and-pen inventories. Vander Linden said the investigators know that several years ago an entire freezer full of biological samples broke down and all the samples had to be safely destroyed. But a complete inventory of what was in the freezer was not done before the samples were destroyed. Vander Linden said there's a "strong possibility" the vials were in that freezer and destroyed, but that isn't known for sure. * See note on CDC Numbers. **See FluTracker data by country and note on abetting the Pandemic. Earlier WHO Updates here. * See note on CDC Numbers. Earlier WHO Updates here. * see note on CDC Numbers. 'The situation continues to evolve. As of 19:00 GMT, 1 May 2009, 13 countries have officially reported 365 cases of influenza A(H1N1) infection. The United States Government has reported 141 laboratory confirmed human cases, including one death. Mexico has reported 156 confirmed human cases of infection, including nine deaths. The following countries have reported laboratory confirmed cases with no deaths - Austria (1), Canada (34), China, Hong Kong, Special Administrative Region (1), Denmark (1), Germany (3), Israel (2), Netherlands (1), New Zealand (3), Spain (13), Switzerland (1) and the United Kingdom (8). And we observe today that a very real “booming buzzing confusion” uncannily abounds, usually coordinated by the “central institutions of the U.N. system”, amidst the usual platitudes of “prospects for peace, welfare and human dignity”. Who can make any rational sense of all these global events in real time, and all compressed in a short decade initiated by the crisis of 911 – from global war on terror, to global financial collapse, to global warming and global 'carbon credits', to now global pandemic? Does it require a brilliant man or woman to do so? An Einstein? A Rosalind Franklin? I have reached the conclusion as an ordinary human being of no particular notable brilliance, that it perhaps does only take an un co-opted plebeian to do so. Below is my analysis of the global pandemic now intruding in our lives just like the 'war on terror'. An alert just came home from my kid's school outlining the procedures they will follow in case the school has to shut down. Several schools in the vicinity have already shut down. So what is it all about? If you go to the 'experts', you will surely learn it. Therefore, while I am not a biologist, in the past few days, I have had to become one by necessity of being a parent, to protect my family; so I know only as much as the title prominently displayed on my forehead, which spells 'expert'. Watch out for us 'experts' – we can suspend the laws of physics just because we say so. Our degrees, Nobel prizes, and elitists' applause are our credentials! So when an 'expert' from our learned ranks, one with known agendas written in our own hand writings but in other peoples' blood, brings you the news, look into it with great care and due diligence – lest you shortly regret having taken actions (or inactions) based upon it. I find the afore-paraphrase of verse 49:6 from the Qur'an (the holy bible of the priests of 'Islamism', but for most Muslims to be left on the highest bookshelf for occasional dusting and annual pious rehearsing on death anniversaries and fasting) phenomenally insightful in unraveling current affairs (“O ye who believe! if a wicked person comes to you with any news, ascertain the truth, lest ye harm people unwittingly, and afterwards become full of repentance for what ye have done.”). However, since I don't know in general, who is wicked and who isn't, as wickedness today comes wrapped in holy white, science, experts, presidents, shills, and "errand boys", and since our times have shown that it is almost trivial to make patsies of even the most sincere peoples to serve the devil's agenda, I apply this wisdom to all news and all bearers of news, all science and all bearers of science, and I don't much care for what's stamped on their lauded forehead. Atheists and Agnostics of course may prefer to rely on Bertrand Russell's discourse on commonsense to adjudicate wisely. If only we, the 'untermenschen' of humanity, the 'cattle' being led to the slaughterhouse, had collectively substituted some iota of commonsense from the very day of 911 for all the mantras by experts who shilled and continue to shill, who killed and continue to kill, for empire, we surely wouldn't be here today, “... on the verge of a global transformation [awaiting] the right major crisis and the nations will accept the New World Order.” Please read on to understand how the multitude of crises perch humanity on that very cusp of global transformation with its oft-stated agenda for population reduction (also see analysis of NSSM 200). The latter is evidentially accomplishable as germ-warfare not only on 'target ethnic groups', but also on global crop, and thus global food production. And all attributed to natural causes, happenstance, incompetence, or unforeseeable blunder. In this pandemic which is so deliberately being allowed to spread to other regions of the world, we might well be looking at the formation of a pretext for a new global central authority to supersede the largely advisory WHO, as direct global controllers of global public health, just as is now proposed for global central-banking to control global economics, global carbon credits to control global production (emissions), and the global war on terror which has already become the global truth du jour to control and deny essential liberties, all together constituting a global police state. 'One-world' government if you will (see Gideon Rachman's Financial Times Oped And now for a world government, December 08, 2008). In another 100 years, perhaps only 20, even to fart would require some 'fart-credit' from a global authority as it monitors the affluent on its ubiquitous sensors triggered off RFID implants in all that is living, and all which is commodified! Some of our generation, caught Between the Two Ages (see Zbigniew Brzezinski's Between Two Ages, 1970), experience that angst in anticipation of global servitude to the Pharoahnic oligarchs. But our grandchildren will be taking it as their normal way of life without a second thought, despite their yoke of chains from uterus to grave. And 'that's just the way it is' being planned. To derail it today, as well-nigh a fait accompli as it appears, is still far easier than it will ever be in the future – until such time when another Age will finally beckon. When, once again, “two cultures and religions [will] overlap ... when a whole generation [will be] caught in this way between two ages, two modes of life,” to resist change, but the new will finally overthrow the old at great human cost and bloodshed. No empire lasts forever. The rapid spread of the swine flu 'H1N1' epidemic to other parts of the world is largely through Air Travel. With all the Homeland Security Apparatus so ubiquitously deployed at all the International Airports of the world to fight the global 'war on terror' against the 'Islamists', it ought to be rather trivial during check-in at departure points at all the international airports in the world to ascertain if a traveler has been to Mexico and deny boarding (for the immediate near term). The same type of form that is used during entry into the United States, and into most other countries, which asks the traveler questions on their whereabouts can be used at departure points, augmented by the same type of questions that are asked to fight the 'war on terror': did you pack your own bags, do you know anyone who has been to Mexico recently? And repeated a few times through the many steps of screening where they force you to take off your shoes, blow air up your skirt, and get their jollies looking at your imperfections through body imaging to identify 'suspicious' peoples who need to be interviewed further, before being let on board. They do this routinely – I am subjected to it frequently whenever I travel – why not here? They can trivially shutdown schools as preventive measure and inconvenience thousands of students domestically, as noted in this AP report of May 02, 2009 (cached here): “The Education Department said that more than 430 schools had closed affecting about 245,000 children in 18 states. ... The government issued new guidance for schools with confirmed cases, saying they should close for at least 14 days because children can be contagious for seven to 10 days from when they get sick.” But they cannot detect and prevent a handful of travelers from getting on the plane through judicious assessment? Given the seriousness of the matter by their own admission: “It's a virus that we've never seen before. There's no background immunity in the population and it is spreading from human to human, all of which has the potential for a pandemic.” If the authorities were really concerned about the pandemic, a sensible human being among them would surely have reflected that some obvious policing and restrictions at points of embarkment would detect most of the obvious first order virus-carriers who are now reported, after the fact, to have been to Mexico. This is the low-hanging fruits of the tree which are not being plucked! It is interesting that almost all confirmed cases occurring in other countries of the world outside of Mexico and the United States, are directly traceable to visitors who have been to Mexico, or came in contact with someone who arrived from Mexico (see FluTracker and click on the balloons). It does not take a rocket scientist to figure out that the pandemic can be immediately mitigated by deploying a rational commonsensical first-order check on Departure Airports where the infrastructure to do so is already in place! This is the same sort of commonsense that is seen missing in all the crises since 911 which are subsequently blamed on incompetence, happenstance, blowback, complexity, unforeseeability, etc., and for which some global solution is hurriedly proposed. In fact, its immediate analogy is to both 911 and the financial crisis: the many deliberate stages (see Monetary Reform Bibliography) which were setup to calculatingly lead to the banking collapse, the solution to which, now the same financial ruling elites claim is a global monetary system in the hands of the same banksters. Similarly, according to the 'official dissent' to the official story of planes highjacking, the authorities deliberately monitored the highjackers for months rather than interdict them before 911 for various justifications. Their not heeding many a warning coming from intelligence sources is deemed “incompetence”, and the rationale for the attacks, “blowback”. The one common sacred-cow axiom among all these manufactured explanations: 911 was an invasion from abroad, the work of 'Islamist terrorists', rather than an inside job for “imperial mobilization”. The same thing is happening here: Pigs are being blamed as the first-cause prime-movers of this epidemic, and various justifications employed to monitor its spread, rather than interdict its carriers to prevent it from becoming a pandemic. Whether it is the pigs in the pen or in the lab who unleashed it, the first-cause of swine flu in becoming a pandemic is evidentially the traveling-humans (not pigs, unlike the case of bird flu where birds are the prime cause of its spread), flying their payload from country to country in airplanes after passing through international airports which are controlled tighter than Fort Knox. Therefore, the following advisory by WHO on “No rationale for travel restrictions” is not only irrational, and their justification specious, but outright criminal, for it is directly abetting in the spread of the pandemic in the name of science and mathematics. The same sort of “Scientific research based on mathematical modelling” gibberish was used to sell mega-loans to the poor developing nations to put them under massive debt to the World Bank, and then let the IMF let loose upon them to plunder at will (also see John Perkins' EHM, page 101, 2004). The same sort of “Scientific research based on mathematical modelling” gibberish that is used to teach modern economics to generations of IVY and LSE students to justify making the gluttonous banksters richer and richer through their calculatingly induced credit-expansion-contraction-cycles (just as famously predicted by Thomas Jefferson) under their direct monopolistic control of the global central banking syndicate. And the same sort of “Scientific research based on mathematical modelling” gibberish that was employed by NIST and Popular Mechanics which 'proved' the absurd 'pancake collapse' of the WTC towers (see latest reality-check here). All the murderous pretexts are compressed in one short decade. What's the rush? Isn't the new 'one-world' empire supposed to last a thousand years? Today, as yesterday, one can find legions of scholars, scientists, Nobel Laureates, and many an erudite “errand boy” swearing by these “Scientific research based on mathematical modelling”, while humanity is starved, robbed, decimated, victimized, and now gratuitously subjected to pandemics that are manufactured in Western laboratories for the oligarchs' global population reduction agenda. A mathematics that is deployed in social sciences and which fails the test of commonsense, is a knife calculatingly constructed and sharpened to slaughter the sheep, not to pair fruit. I respectfully challenge WHO to rise to the occasion despite being an agency of the United Nations, constructed by the financial oligarchs, to calculatingly orchestrate world governing bodies and global structures. I ask its respected Director General, Dr. Margaret Chan, who is entirely and monopolistically determining global policies which affect all nations – her 'advisory' is gospel for almost every country – to give humanity some respite, for she may not be aware of the overarching agendas any more than any other highly compartmentalized black-ops' unwitting executioners. There is much discrepancy in reportage. The FluTracker using its own heuristics shows the spread of disease faster than officially reported. This report (cached here) by Reuters noted “176 deaths” in Mexico on April 30, 2009, whereas the officially reported “laboratory confirmed” deaths in Mexico as of May 05, 2009, according to WHO Advisory Update 16, is still only 29. The FluTracker shows “fatal cases” in Mexico to be 105 on the same date (20:41 EDT). Why this count anomaly? Therefore, when the FluTracker map annotated Missouri with “2 confirmed cases”, it actually meant two “patients reported flu-like symptoms” which was confirmed by “State Public Health Laboratory” to be of “previously unseen type” virus. But the viral type has not yet been positively identified as 'H1N1' which only CDC is capable of doing (as per “Reporter Tries to Get Tested for Swine Flu” and this), and the specimens will be sent off to CDC for confirmation. As one can easily see, this kind of information can be quite useful provided one is able to discern hearsay from facts, as was possible to do in this instance. Thanks to Dr. Henry Niman for voluntarily compiling this data in the FluTracker. However, when the health authorities are themselves beholden to powers from above, and their intent is suspect under certain circumstances, such as the case of the long standing United Nation's agenda for population control, fertility control, and ultimately, population reduction (as for instance outlined by Henry Kissinger in the now declassified National Security Study Memorandum NSSM-200 of April 24, 1974), the advice of the health authorities may not be trusted, especially when it is international. Even if, such advice is given with the best of intention by the peons (Doctors) working in those institutions. These specialists are merely the 'errand boys' doing their compartmentalized jobs for which they have trained as narrow experts. They are part of the establishment, and their rewards and careers are rooted in unquestioningly following the mainstream practice of medicine which is entirely run under the aegis of central organizations like the FDA and the AMA. So who can one go to for advice to ask what actual chemical cocktail is in a vaccine? I tried that for the Hepatitis B vaccine which was needed for my kid in order to volunteer at a local hospital. I consulted all who were in reach of my phone, and I am rather well connected by plebeian standards. All I was informed was what they were themselves told by the FDA, or had read in the brochures that were dropped off at the doctors' front office by the pharma-reps. So what's wrong with FDA (and pharmaceuticals) running the show? Well, they are beholden to many a corporate interest, atop of which, sit the Rockefeller interests which control much of the global pharmaceutical industry (see Eustace Mullins, Ibid.) 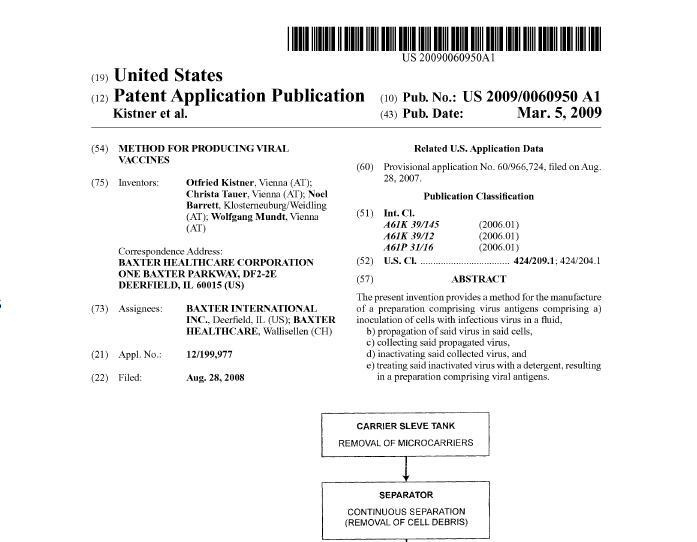 and their research in drugs and in patenting life, which in turn plugs in seamlessly with the bioweapons research interests and primacy agenda of the national security state. 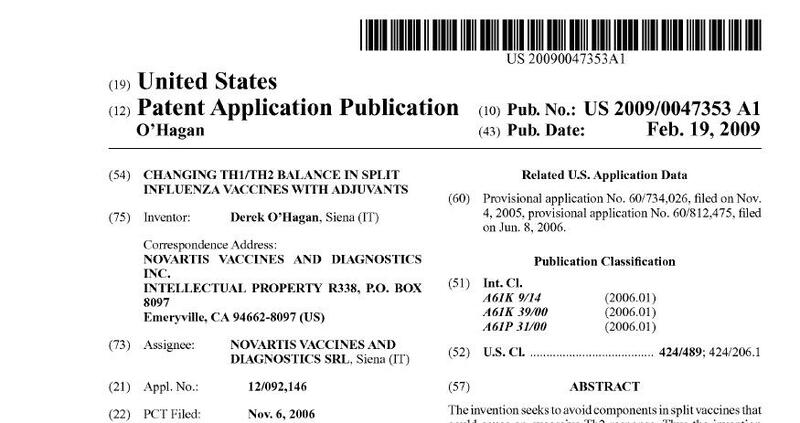 The interlocking is so complete among the various participants, from academia to industry to weapons labs, and also so opaque, that vaccines are like a cookie. One just can't know what's in them, or why different chemical/molecular formulations exist in a particular vaccine, or their long term impact, even if one is a well-intentioned scientist in a relevant discipline. Probably the only ones to really know are the those who perfected them in the research labs and they aren't gonna tell you – patents of course, but more pertinently, classified information. Even giving samples of bird flu vaccines to other nations deemed hostile to the United States and Western interests, is considered a threat to its national security! So vaccines can evidently be agents for both short and long term biowarfare as much as they can be antidotes for diseases. Under the best of circumstances, under non-mala fide intent as stated earlier, only its harmful side-effects and efficacy are rational determinants in the decision making of whether to take it or not. Religious beliefs are beyond the realm of this analysis. Therefore, most people base their decision on trust in these governing bodies – that they would not deliberately harm them (inadvertently perhaps, for profit motive surely, but not calculatingly to implant an RFID chip inside them on contrived pretexts, or reduce the fertility rate among an ethnic group or entire population). This trust occurs for the same reason as the Americans' “United We Stand”. Under such dubious circumstances, avoiding vaccination, especially of potentially biowarfare related pathogens, is minimally a double edged sword. Since one is not privy to what's in the vaccine, therefore, unless one can get it from the same batch as taken by the Rockefellers, the Rothschilds, and Henry Kissinger, taking one's chances with the statistical odds becomes a commonsensical prudence for those not in that club. Also see Zahir's comments of May 07, 2009 under Rich Nations Could Claim Most of Swine Flu Vaccine. : Eustace Mullins offers a rational counterpoint to this position in his carefully researched book “MURDER BY INJECTION The Story of the Medical Conspiracy Against America”, 1988, wherein he argues that vaccination (immunization) is outright responsible for many of modern systemic diseases, and that it was the Rockefeller interests who pushed it upon America (and through their control of the UN upon the rest of the world). 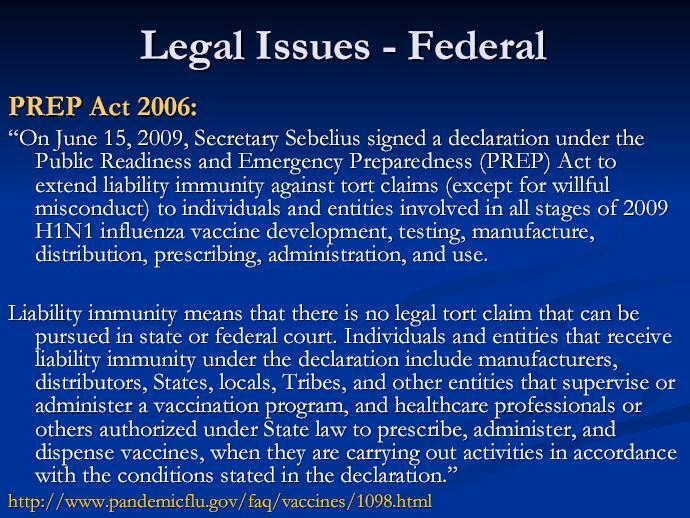 That blanket position on vaccination being a poor medical practice ab initio, a quackery, stands on its own and is not considered nor challenged here. The point of focus in this note is decision-making under possible mala fide intent (not quackery) when people do follow and accept the conventional practice of vaccination – as I do. Perhaps a rethinking is required there too, but I haven't researched quackery as yet! This video documentary by Dr. Leonard G. Horowitz about medical madness, cloaked in bioterrorism preparedness, certainly leads in that direction. So does this video documentary Vaccination - The Hidden Truth made by the Vaccination Information Service. It is not clear to me if these opinions are confusing due process of medical science which does entail a complex cost-benefit-risk statistical analysis for public-health that is surely plagued by failings in commonsense and excessive greed when led by large pharma, with the political abuse of medical science in general to alias hidden war agendas on unsuspecting populations. My immediate concern is the latter which includes an entire gamut of political abuse, from eugenics to GMO foods to epidemics – which harvests justifications and techniques from science and technology – all for population culling and elimination. It's akin to abusing Islam to create the fabled enemy of 'Islamism' for a war-making agenda – whether or not there is some inherent deficiency in the religion is irrelevant and orthogonal to its political abuse for “imperial mobilization”. Swine Flu: That Great Debate of 2009 – An abbreviated version of this report with embedded videos suitable for class room presentation and forensic debate: assign it as homework and re-enact in class with two teams making Affirmative and Negative case arguments and letting the rest of the class pose questions and judge who has the more compelling case! New Discovery Nov 05, 2009: Guilty of Insider Trading “Morning Joe” Features Dr. Nancy “Get your damn vaccine” Snyderman and NYT report on Dr. Nancy Snyderman August 21, 1999.